With this edition of the Quake Magazine (original title eh?) we venture into unknown territory. With id's Quake III Arena on the horizon posing as a multiplayer dedicated platform, our beloved single player Quake is in jeopardy. Perhaps that is jumping to unfounded conclusions however. For what has really captured the single player editing and gaming niche since Quake II? Unreal has turned out maps in spurts. Sin? Sin who? Half-Life? Perhaps Half-Life. Neil Manke's recent release of USS Darkstar does prove once and for all that a lone mapper can deliver a quality production. Or perhaps it's the next batch of games waiting in the wings? Kingpin seems to have created a buzz but what will it be like to edit? But why do we have to always be waiting for the next new thing anyway? Quake I in GL is absolutely gorgeous. I still find myself returning to that platform to take on a Death Knight or a pack of heavy breathing Scrag now and then. Perhaps I have been remiss for not pursuing the trickle of new maps for Quake I. I suppose I have been. Quake II while slowing down shows no signs of rolling over just yet either. Some very high quality levels have appeared in the past several months. Perhaps we can make do with a bot laden Quake III Arena until Quake IV returns to recapture the single player niche. I like to think that is how it will play out, but then again who knows? 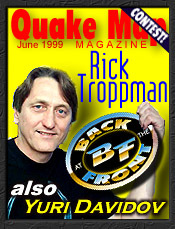 This months Quake Magazine has some good stuff from two of those quality Quake II mappers still on the scene, Rick Troppman and Yuri Davidov. Lt Dan has provided us with his thoughts on the highest voted Quake II levels which make up the Top Ten List. And there is even a comix and a very special contest to round it all out. Enjoy! "Quake II is still, in my mind the absolute best pure shooter out there. Half-Life is an absolutely awesome enhancement to the great Quake II engine but somehow lacks the monsters that Quake II has to offer." "I enjoyed playing HalfLife, but when I got to the end of it, I lost interest to it. Probably it's because this game has an integral and accomplished subject matter, while Quake2 leaves more space for fantasy." Ok, get your thinking caps on. This Quake trivia contest will have you fraggin' your brain to win this Limited Edition Exclusive Prize. Looking for some good Quake II Levels to play? Lt. Dan takes a look at the 10 most popular as voted by you. You asked for it didn't you? The Comix return.